Mike Martin is an experienced travel journalist, who has written for Teletext and The Travel Editor for 10 years. He specializes in food and wine, culture and activities holidays, and his favorite country is France. Puttering through Burgundy on a barge, the thought that comes to mind is of Mahatma Gandhi’s famous quote “There is more to life than increasing its speed.” Sometimes, even on holiday, we are so often in a rush to get to our destination we don’t take in the scenery, but a barge moves at just the right pace to absorb the slowly but surely changing landscape. A weeklong barge trip with a company such as European Waterways is a great way to get to know the region, especially on a vessel that offers the very best in regional Burgundian food and of course world-class wines. After being met at Dijon station, it’s a short drive to the barge moored in Escommes – and from that moment on you can relax, which you might need to after the vagaries of the French TGV system. The crew includes two hostesses who offer you a glass of Champagne on arrival and look after you for the week. They even managed to find out the weekend football scores despite patchy phone signals and no Internet access. After the welcome glass of champers disappeared, it’s time to dump the luggage and have a quick look round the barge. L’Impressioniste is a former freight barge converted into a hotel in 1996, and was refitted in the winter of 2009. It’s 38m long, has a maximum speed of 12 knots and is extremely comfortable. Obviously the rooms aren’t huge but they are cleverly designed and spotlessly clean, with lots of space-saving ideas, and they all have generous windows that open. The lounge area has a fully stocked bar, but the real draw is the outdoor deck area with lots of room for a large table and chairs, sun-loungers and a hot tub. Park yourself here with a book, pair of binoculars and a camera and simply watch the Burgundian countryside drift past at a leisurely pace. Just when you think “it’s time for a drink,” hostesses Elza or Bonnie will magically appear. The best way to understand French wine regions is to visit them. All of those complicated names and appellations can confuse, but when you’re looking at a map with lots of famous villages on it a lot of the mysteries are solved – and the wine itself never tastes better than in the place it is made. Even better, the barge’s captain James Bairstow trained as a sommelier and knows his stuff. There are now lots of wine-tasting tours around the world, but some of them actually overdo the visits – going to vineyards several times a day to meet the owners can be a little repetitive and takes the shine off. The itinerary here is judged just about right – there are two big wine-tasting events, interspersed with other visits, none of them outstaying their welcome, and there is plenty of opportunity to buy with no obligation. Even without the excursions there are lots of wines to work your way through at both lunch and dinner, both of which are served with a white and a red. Burgundy is very easy to remember for grape varieties – if it’s white it’s Chardonnay, if it’s red it’s Pinot Noir. However these two grapes are grown on many different villages and areas within Burgundy to produce an amazing variety and depth of wines, all of them oozing with the flavors of the soil and the climate – the terroir, the French call it. The crew will talk you through the wines you taste with each course, and they are specifically chosen to complement the regional food served with them. On the first night, for example, dinner kicks off with a Philippe Delagrange Meursault 2006 Premier Cru. The two famous wines of Burgundy are Pommard and Volnay – the first are classified as “masculine,” Volnay as “feminine.” Both are packed full of minerally, fruity flavors and are pretty wonderful. On-board chef Maria insists on using only fresh, local ingredients bought that morning and tweaks the menu depending on what is in season. So it’s French cooking with a light touch, featuring for example guinea fowl, duck or of course beef, with beautifully seasoned vegetables and relatively light sauces. The vichyssoise was a particular highlight, and the salads were also perfectly presented. Bizarrely the only classic French dish that was missing was rabbit – and for a very strange reason. A superstition on boats means that rabbit is never served – or even mentioned by name. Apparently it’s a bit like actors saying Macbeth in a theater, considered extremely bad luck. No one quite knows how this legend started, but to this day P&O Ferries for example never serve rabbit on board a ship. After an enjoyable visit to Chateau de Commarin on Monday, by Tuesday you’ll be ready for some serious wine tasting and sightseeing. The barge by this time has moved towards Beane, a picturesque town with one must-see, the famous Hotel Dieu Hospice. Built in 1443 by Philippe-le-Bon, Duke of Burgundy, it was a hospital and home for the poor following the Hundred Years’ War and the Black Plague. 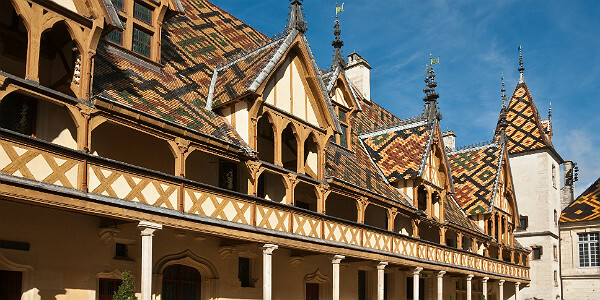 The Hospice de Beaune owns a large amount of the vineyards in the area and holds one of the largest wine auctions in France. Its distinctive roof tiles, gargoyles and amazingly well-preserved interiors make it worth an hour’s visit. Wednesday sees a real gastronomic treat in a quite stunning setting. The 12th-century Abbaye de la Bussiere is now a top-class hotel (from €470 a night), and after a walk around the gardens and a look at the old wine press, it’s time for lunch in the vaulted, Michelin-starred restaurant. This is high-quality French cooking, with regional specialities such as Burgundy snails, duck, trout and even rabbit – remember you’re off the barge now, so this is your only chance to eat du lapin on the trip. 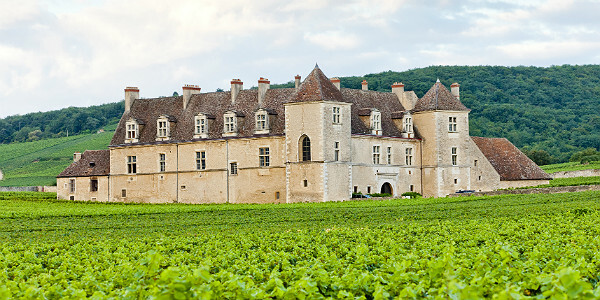 A trip to wine museum Clos de Vougeot involves a 45-minute drive through the region’s top vineyards, and gives you an idea of just how important the terroir is to this region. En route is La Romanee Conti vineyard, rumoured to be the most expensive piece of land in the world – it grows only Pinot Noir, and they sell at around €6,000 per bottle. Outside the Clos de Vougeot building the vines come right up to the front door, and you get a real sense of the earthy minerality of the soil. The poorer the soil, the harder the plant has to work to create the fruit and the better the resulting grapes. Clos de Vougeot was the home of the Chevaliers du Tastevin, who awarded prizes every year to the finest Cote d’Or vintages. The lives of the Cistercian monks who planted the vineyards back in the 12th century comes to life – they had a tough life, with one set of clothes only, they had to be silent for most of the week, eat no meat and worked and prayed hard. They did have one big bonus though – they were allowed one bottle of wine per day – worth it on balance. On the last day, a trip to Dijon’s market is well worth it for stocking up on treats, including wines and cheeses, and in the evening the crew of L’Impressioniste surpass themselves. For the captain’s dinner everyone gets dressed up, Captain James pulls out the very best vintages from his cellar and Chef Maria whips up some glorious food. The Louis Jadot Puligny-Montrachet 1999 which kicks off proceedings is worth waiting a week for, and it’s nice to have a touch of formality at the end of a very laid-back week. If you want a crash course in Burgundy’s wine, or to see some scenery, or just chill for a week and watch the countryside drift past, this is a great way to detach yourself from the outside world and indulge in some serious luxury. Just don’t say the “r” word on board. How To Get There: Dijon is approximately 200 miles from Paris, and it takes just under two hours to get from Paris Charles de Gaulle Airport (CDG) to Dijon on the TGV, with one train change. TGV tickets are available through Rail Europe. Best Time To Visit: Located in the middle of France, Burgundy’s summers are warm and dry, and the average summer temperature is in the mid-20s. Barging season in Burgundy runs from April to October, and the high season for barging is from mid-May to mid-July, and early Sept. to mid-Oct. Sept. and Oct. are probably the best months to visit the region as it is grape harvesting season, and many festivals are held during this time period. * All fares are roundtrip including all taxes and are accurate at time of publication. For updated pricing, conduct a new search on Fly.com.